Last edited by Ashli; 11/13/03 07:37 PM. WELL, technically I reside in NC. I'm located in a little town NorthWest of Charlotte. I travel to SC regularly and resided there temporarily for a bit. I'm originally from Virginia though and would love to be able to move back there one day. I currently share my home with 6 wonderful gliders. Gliders have been part of my life since 1997. I am a small scale USDA licensed breeder. Wake Forest, NC. That's right next to Raleigh. I'm from Wilmington. Which is almost in South Carolina. Count me in! I'm still in Durham, right next to the capital city. Well shucks may as well add me to the list too. For now me and my service gliders reside in New Bern, N.C. However we usually travel to Greenville about once a month. Originally from Indiana, I currently reside in Asheville, North Carolina. I spend my time between the Hickory/Lenoir area (where my mom lives) and Boone (where I go to college) North Carolina. My suggies are pro travelers and car riders! Wake Forest, or 5 mins to Raleigh! Crittermom i bet were the only people here in Wake Forest with gliders! i live in raleigh with my 3 gliders since 1998. I live in Canton,NC.Which is only 15 minutes from Asheville,NC.Nobody ever knows where canton is because its soooooo smaaalllll.LOL! I am in Jacksonville, although I am moving to Raleigh late next year. I have two glider pairs: Mik and Sydney & Sheila and Ripper. Shelia has twins right now. So I guess I have six total. Great to see others from NC. if you ever need a super vet go to dr dan johnson at avian and exotic animal care in raleigh on creedmoor rd. he's phenomenal and saved my gliders life 2 yrs ago. to me he's the best in the country. I have heard of Dr. Johnson, from quite a few sources outside of GC. 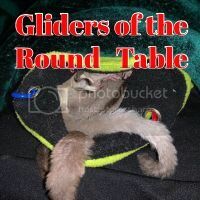 There aren't any vets in Jville that i would take my gliders to. But thankfully i havent had a serious problem, a little calcium deficiency on one female but a little diet change and all is well. Raleigh, NC here. Always looking for glider lovers in the area to chat with. Hi everyone. I just found out that my girls and I will be moving to NC this summer to start my residency. I will be living in Greenville. If anyone knows a good vet for my little ones, I would love a recommendation! Which little town NorthWest of Charlotte. I grew up in Salisbury, and my Dad still lives there. I am currently in Shanghai, China, but my gliders are in Huntsville/Madison, AL. Try Greensboro! I'm from Reidsville just north of Greensboro. And believe it or not, we have an awesome avian & exotics vet in Eden, NC, just 15 min. away and she has a mobile unit. Dr. Lori Harrison, Avian & Exotic Mobile Veterinary Services, 336-623-9191. If you like the BIG city go to Charlotte. Raleigh is big too but not as crowded as Cjarlotte. In raleigh you would be closer to the beach too.